I know at the end of last episode I said I was going to cover an interesting conversation I had with a client about bananas, but I couldn’t make it work here, so it’s an instagram post instead which you can check out at Fitness For Freedom 1 – we have a link in the show notes if you want it to be a bit faster. I want to talk about something much more interesting and relevant than bananas, flow or better yet how you can find it. 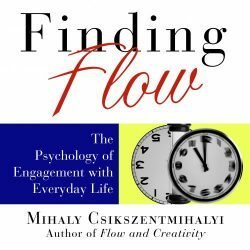 I just finished reading Finding Flow: The Psychology of Engagement with Everyday Life by Mihaly Csikszentmihalyi in his book he defines flow as that state of being where you become so engaged with an activity that time ceases to exist or minutes or hours could seem to go by in the blink of an eye. Athletes will sometimes call this the zone, I know that one time a sat down to write a blog post and I wrote 3 or 4 pages in about 45 minutes, but it felt like only a few minutes had actually passed. I’m sure most of you have experienced this in one form or another, this almost magical feeling where you feel like you can not only accomplish anything, but also enjoy doing it. To me this seems pretty obvious, who doesn’t want to spend more time enjoying what they’re doing? But there’s also another level here, how can you create flow doing activities you don’t naturally love, because the reality is that most people spend most of their days doing things they don’t particularly care to do and sometimes try to actively avoid doing things they know will legitimately make them feel better and bring them happiness, contentment, satisfaction and a better overall feeling of well being or health. Let’s take exercise for example. Most people don’t like exercise, you might be one of those people listening right now and you’re in search of a podcast that is going to help motivate you or get you pumped up to do some exercises or maybe you’re looking for the secret or special exercises that will automatically give you the results you’re looking for? If that is what you’re looking for I’m sorry you are going to be or maybe you already are disappointed. But bear with me just for a minute, what if you were to listen to me right now, maybe you could take or leave the show, that’s fine with me I know I’m a bit dry and sometimes boring on here, but at least you tuned into this episode, because you’re going to have a better grasp on the tools you can use to be autonomous or self-motivated to get the exercises done and you can stop wasting time looking for the right motivational podcast, because I’m going to give you some strategies to get self-motivated right here. I know most people dislike exercise, in-fact only about 10% of the population cares enough about exercise to do it, more people prefer to watch t.v shows about exercise than actually exercise. According to this book people spend about a quarter of their lives doing leisure activities, which can be subdivided into two categories, active and passive leisure. Passive being activities that require little in the way of effort, reading, watching movies and T.V. this is where most people spend the vast majority of their leisure time, but we also have active leisure time. This is where hobbies, playing sports and exercise fall, but most people spend much less time here, even though it’s where most people derive most of their joy, by doing something active, learning and growing as a person. Think about it like this, when was the last time you watched a T.V show and felt invigorated, enlightened or had a sense of accomplishment? The answer for most people is probably never, unless you’re in film school or the t.v industry where you’re learning about how to make better shows. Let’s contrast that to how you felt the last time you put a piece of Ikea furniture together, if you successfully put it together you probably felt a tiny sense of accomplishment afterwards, it stands to reason that you could very well get more out of putting Ikea furniture together than watching television, but given the option to pick one you’re probably going to pick watching T.V, which brings me to the point I’m trying to make, exercise in essence is Ikea furniture. It would be nice to watch T.V, but it would also be nice to have a chair to sit in while watching it. So, how can we make building Ikea furniture the fun or the desired choice over watching T.V and by building Ikea furniture of course I mean doing exercise. Let’s start this with a quick story. A few weeks ago I scheduled in 3 afternoons of shooting mini gif videos of exercise demonstrations for the new fitness apps we’re developing, this was essential 4 or 5 hours straight of me doing one exercise after the other while Jennie, our photography took the photos. It was going to take a lot of work to get all the exercises shot and we had to stay on track so I created a spreadsheet listing all the exercises that we had to shoot and I colour coded every exercise based on the angle it had to be shot from shot, so that we could do dozens on the same camera angle in a row without having to readjust the camera. As we shot these exercises I would unhighlight the exercises so the page became less and less colourful and I quickly realized that the more we shot, the more white the page became, the closer we were to being done and it became a little game. How many exercises could we do in a row before needing to check the screen and how much white can we see? Of course every time we knocked off a colour I would get more enthusiastic and motivated to complete it. This was about a 15 hour job of doing exercise after exercise, but seeing that progress of achieving the micro goal of exterminating a colour literally in front of my eyes really helped me and Jennie, stay focused and motivated to get it done, time actually flew by while we were doing it. As you think about an activity you’re dreading or just don’t feel like doing, but you know for the greater good of your life and health it’s something that should be done, how can you track your progress in the moment of you doing that activity. If we apply this to a fitness example what could you focus on? Let’s take running for example how could you create micro goals for running that will keep you engaged in the moment and help you complete the activity not begrudgingly, but in a way that gives you energy after you complete it? You could time a route and try to run it faster every time, you could run from light post to light post and count how many light posts you could run before needing to walk, you could do walking from light post to light post, then sprint some, jog others, run backwards, you could even say something like – I’m going to complete this loop, but every minute I have to change how I’m moving through it, maybe for 1 minute you walk, for one you do a walking lunge, then you sprint, then you skip then you do bear crawl and you make the rule you can’t repeat anything. Then the game becomes how many creative ways can you move to make it to the end of your loop. These are all things that you can do to keep your mind in the moment and off of everything else. Setting these micro goals and being able to see your progress is one of the first things he talks about in the book and one of the things that are most likely to put you in a flow state. This ties nicely into the next point, which I’ll also start with quick a story. Every night before I go to bed I write out the big rocks I need to get done the following day, the 5 things that have to get done to move my business and life forward. This is more than a todo list, these are the things that I decided are the most important to me and represent a quarter of what I spend my time on. I call it my powerlist. What I try to do, (I’m not perfect at this because I still have days that don’t go exactly according to plan and often I don’t allot myself enough time to get everything done) but I still try, Once I make the list I tackle each activity on it one by one. I turn off all the distractions that I may encounter to the best of my abilities this helps me focus with a micro goal. When one task gets completed I cross it off and take a short break, this shows me progress and then I move onto the next item which is always significantly different, this gives me variety in my direction and is what I feel is the next most important thing to find flow. Let’s bring this back to you and apply it to a fitness or exercise example, let’s say you find your workouts a bit boring, monotonous or time consuming, what could you do to break that? I know when I feel that way I create circuits, quick sets of exercise where I can go from one to the next and the next with few breaks, that quickness and variety helps me to stay focussed. Another thing you could do is try a completely different exercise routine, if you normally do strength try a Zumba class, if you normally do group fitness try a sport like tennis instead. Or get a little but crazy and do 100 reps of an exercise or multiple different exercises in the fastest time possible, I’ve done it with push-ups and pull-ups before, but you could apply it to any exercise burpees, jumping jacks, squats, lunges, you could combine it in a circuit di fast or slow, whatever floats your boat to get in and out at the speed and intensity that is going to keep you engaged the whole time so you feel good after because you said – I’m going to do 100 and then you did 100, because you’re a machine, and don’t you forget it. That’s all I’ve got for today, Finding Flow by Mihaly Csikszentmihalyi is a great book to help you figure out what strategies you could use to create flow in your life. If you’re really interested in learning more about flow in general his other book Flow: Living at the peek of your abilities is a really good read as well and I recommend them both wherever fine books are sold.